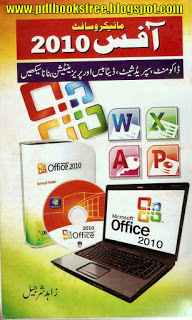 Microsoft Office 2010 Urdu Learning Book Zahid Sharjeel. Step by step easy tutorial to MS office 2010 in Urdu. Learn Microsoft word in Urdu. Learn excel in Urdu. Learn Documents in Urdu. Learn spreadsheet in Urdu. Learn Databases and presentations. Your first comprehensive guide to the latest version of MS Office 2010. You can download this tutorial book from the below mentioned link in PDF to learn offline. good book for people who have no basic idea of computers and software.